167 Rivers Edge Road – Bozeman, Montana is a bold, beautiful, and thriving town with energy well beyond its population and geographic footprint. Within the Gallatin Valley there are numerous micro-climates, neighborhoods, and view sheds, however, there is very limited river frontage, especially on the East Gallatin River, renown for its fishing. To say this property is a rare offering is an understatement. Situated on land that once was one of Bozeman’s original historic homestead properties, the ground is rich for farming, the views are 360 degrees of expansiveness, the wildlife is plentiful, and the main home fulfills every dream and notion of Montana luxury living. First and foremost–what sets this property apart–is the idyllic, winding, clear-watered East Gallatin River. Few spots exist with this ability to walk out your door and fish while being surrounded by the awesome views of the Bridger Mountains, the Gallatin Valley, and the mountains ringing the valley. This is a slice of heaven located minutes from Bozeman, the airport, big box stores, and all the amenities of a thriving community, with abundant wildlife in your backyard and fish waiting to be hooked. 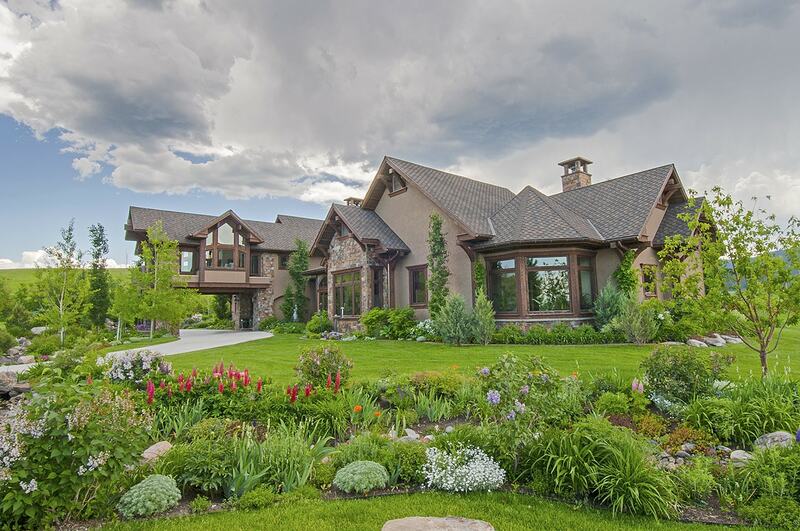 The log-and-timber style main home, constructed in 2007 by the highly-respected builder Jim Sythe, is timeless, with every detail well thought out. The home is tailored to today’s Montana lifestyle, with durable materials, easy-maintenance, and a sense of absolute comfort. The home sits on the west side of the property, with the east end of the estate being occupied with the 1920’s original “caretaker’s/guest” home, the 1912 “party barn”, and the additional garage/storage building. Jack leg fencing sets off the acreage of fields, meadows, water features including the lake, and lawns. A circular driveway, flanked by stone and log pillars, leads to the home’s front door, located a few steps up with a wide welcoming veranda. The home’s exterior is a pleasing combination of honey-colored logs, flagstone pillars, stone walls, bay windows, wood trim, and wood shingles. All the natural materials come together to create a solid home that is both majestic and inviting. See the 167 Rivers Edge Road Listing HERE. Balance, scale, the integrity of materials, and “room-flow” are the hallmarks of this home. The Montana setting, with the river, vast fields, and close-by Bridger Mountains are an integral component in home’s design. Each major room takes full advantage of the private, gorgeous surroundings, with walls bumped out in bay window configurations to create side windows that capture the tremendous views in 3 directions. Rooms and windows are strategically positioned to ensure that wherever you stand, you are able to witness the majesty of Montana in all directions, as well as bathing rooms in natural light. The large-scale, solid wood, the front door is framed with old fashioned bubble glass, with an arched upper window mirroring the bank of windows across the expanse of the living room portion of the Great Room. The front door opens into the foyer and hall, part of the open floor plan Great Room. The heartiness and Montana roots of the home are immediately apparent, from the reclaimed timbers, vaulted ceilings, ample use of stone walls, welcoming fireplaces, and circular-sawn oak flooring. The Great Room is the core of the public spaces and is comprised of a very airy and connected living room, dining area, and gourmet kitchen. The floor plan is circular, while spaces retain the distinct individuality of being designated rooms due to varying ceiling heights, strategically placed hand-hewn timbers that serve as posts to visually define areas, and the living room is sunken slightly at a lower elevation. The mighty stone fireplace and wrap-around stone hearth anchor the living room, adding dimension and balance to the epic views from the north-facing wall of windows, along with east and west side windows. You can warm your hands in front of the fire and watch the trout rise in the lake, just beyond the windows. The log and timber structure is “lightened” by the numerous windows and the neutral toned plaster walls. The vaulted ceilings are finished in reclaimed wood tongue and groove, and overhead fans ensure air circulation since the home’s air conditioning system is rarely required. Everyone will want to gather in the kitchen and dining areas of the Great Room. The spaces are set apart by the large U-shaped granite-topped kitchen island and reclaimed timber posts. A cozy sitting nook with a gas fireplace set in stone and a large dining area with bay windows and glass doors to the outside entertaining areas flank the island with its comfortable bar seating for 6. The kitchen is meant for a serious cook, with Sub Zero refrigeration faced with reverse-sawn wood, a Wolf 5-burner gas cooktop and Wolf double wall ovens, and a big farm sink facing the evening sunsets. The custom wood cabinetry with flush doors is set off by furniture-style cabinets with black distressed stain, some with glass fronted upper cabinets. The hardware is beefy, and hand forged, and a custom butcher’s block chopping island adds yet more flair and style to this French-Meets-Montana Farmhouse style kitchen. The style continues in the butler’s pantry, which is a large room with additional granite counters and one expanse of butcher block counter, furniture-style cabinets, including a tremendous china display cabinets, and a glass door to the outside patios. The very private master suite, accessed from the opposite end of the main hall from the living room, is entered through wood French doors that open to a roomy transition foyer. Wall-to-wall carpeting, plaster walls, wood trim and doors, and vaulted ceilings continue the high standards set throughout the home. The suite includes the elegant bedroom with a log wall to accent the headboard, glass doors to the private patio overlooking the lake and lawns, a sitting nook with a stone fireplace, his and her walk-in closets, and an opulent master bath. The bath includes travertine marble flooring and vanity top with his and her sinks. The jetted tub is surrounded by an unusual and noteworthy slab of marble that has veining in it resembling the branches of a tree. The walk-in, glass-fronted shower with 3 shower heads features a pebbled stone mosaic that corresponds to the backsplash of the vanity. The space is softened with a curved wall. The main floor also includes a home office, laundry room and a beautiful powder room with an art glass sink set in a slate counter topping a distressed black wood vanity similar to cabinetry utilized in the kitchen. The laundry room features natural porcelain stone counters and floors, wood cabinetry, and Whirlpool washer and dryer. A sewing and crafts table is set up in one area of the laundry. The main floor home office is in a quiet area off the large back foyer just off the garage and the wide open staircase to the upper floor. The office has ample storage, great natural light and a glass door opening to a private front porch. The upper floor is accessed from the back foyer, which is a “landing” place for those entering from the 3 car garage. Open, with a soaring ceiling and windows extending from the built in bench to the ceiling, the foyer is finished to the same level as the entire house. The wood staircase and flooring has a runner, and at the top of the stairs, the wood flooring transitions to wall-to-wall carpeting. The entry room for this level is an impressive second home office, with built-ins, a vaulted ceiling, and the main wall constructed from logs to add a cabin feeling to the space. The hand hewn logs, which are sparingly used in various areas of the home, add warmth and flavor to the home without ever being overbearing or heavy. Beyond the office is a lovely guest suite with its own balcony overlooking the north lake and Bridger Mountains. A Jack and Jill bathroom with porcelain stone flooring and tiles includes a tub-shower combination, and a vanity and toilet connecting with the office. The lower level is accessed from a wide landing and staircase directly beside the Great Room. A stone wall and ceiling-high windows invite you to go down to this carpeted level and enjoy the family/ media room. The family room is sizeable, and like the living room above, is sunken a few steps down, with high ceilings, a stone fireplace, and surround sound for media enjoyment. A wet bar, with black slate counters, bar seating, and a kitchenette loaded with storage, will ensure everyone gathers around the pool table, and heads down the hall to the glass doors opening to a full gym with a mounted TV and a full bath just across the hall. Two private bedrooms are located at the east end of the hall from the staircase. One is a Junior Suite with a full bath, double sinks in the porcelain stone vanity, and a nice walk-in closet. The lower level includes the mechanical rooms as well as large storage rooms and closets. Throughout the home, woodworking is a key element, with meaty moldings displaying the craftsmanship utilized in every room, including the laundry room. The home has a sense of continuity due to the repeated use of key materials such as the sandy-white porcelain stone utilized in most of the bathrooms. Storage and built-in cabinets are also a key element, ensuring the home is effortlessly tidy and organized. The color palette throughout is natural and muted, with plaster walls in soothing shades of muted mossy green or pale vanilla cream. The wood tones are rich walnuts in the trims, with the flooring a hazelnut brown, and the logs a light honey with chinking to match the plaster cream walls. The carpeting is of the highest quality in a neutral but warm beige. As stunning and inviting as the interior of the home, the outdoors is always present. Along with the numerous windows and glass doors, there are private decks and porches, the wide front veranda with seating, and the main entertaining patio off the kitchen. This patio is an extension of the home, with its eating areas, grilling station, and outdoor fireplace. The patios readily transition to the lawns, and throughout the property areas are set up for enjoying the ¾ acre lake stocked with rainbow trout, the Gallatin River, and nature either with activities or areas to sit and reflect. There are fire pits, fishing stations, places to roast marshmallows.There is also the historic original 1 story with a basement ranch house on the property, built in the 1920’s and somewhat renovated in 2002. This simple 4 bedroom, 2 bath home has wood floors on the main floor and carpeting in the basement, a new gas furnace, its own well and septic system, and a basic kitchen. This is an ideal structure for a caretaker. As state-of-the-art and pristine as the main house is, this one is very straight forward, simple, and valued and sold as it is in its present condition. A historic barn with signatures carved into a post dating back to 1912 is the ultimate man cave and party barn. The insulated and heated structure, which has been extensively renovated, includes a sound system, a main floor workshop, and attached storage shed. The upper level is charming and ready for weddings, parties, and just enjoying the sense of history. The are plenty of places to store vehicles and Montana toys, beginning with the heated 3-car garage attached to the main home. The main garage has a dog kennel, a dog bath, tons of storage including areas for coats, boots, and gear, and south-facing windows. There is an additional garage next to the main home with a covered breezeway between, the tractor/vehicle storage in the barn, and the free standing 3-stall pole barn built in 2006 close to the ranch house. By the river, a small shed is used for fishing and sporting equipment. The home is immaculate and in move-in condition. View 167 Rivers Edge Road Listing HERE.